FAQs / Can I print multiple/variety-of asset labels on the same page? Yes, you’ll need to disable Single Step Printing for that. To do this, hit the bell icon in the upper right and go to Print Queue. Uncheck ‘Enable Single Step Printing’ — this will hold all the print commands in the Print Queue for you. 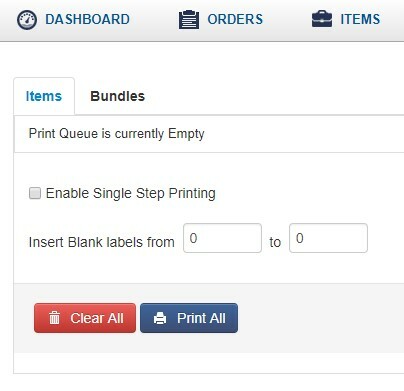 a. Click on the Print Label option for an asset, which will add it to the print queue. Or select multiple assets from the asset listing page and click ‘Print Label’ from Actions. b. Go to the Print Queue when you are ready to print. c. Click the ‘Print All’ button. Depending on whether you have Email Print Labels enabled (from More –> Alerts), you’ll either receive an email with a PDF attachment of the labels or a popup window with a PDF of the labels. – If you wish, you can re-access the prints by going back to the Print Queue and perusing the “Recently Printed Labels” sidebar on the right. You may need to refresh the web page in case the process takes a bit longer. See sample here. 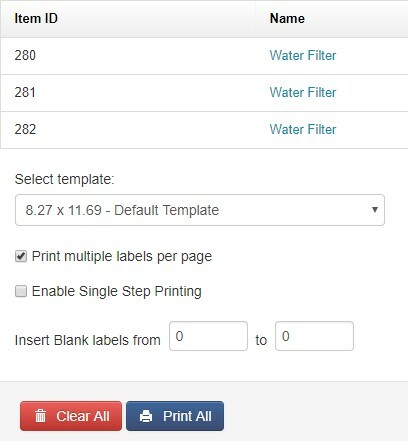 – If you simply wish to print out more labels than the number of items shown in your item listings, you can change the number of records to display.